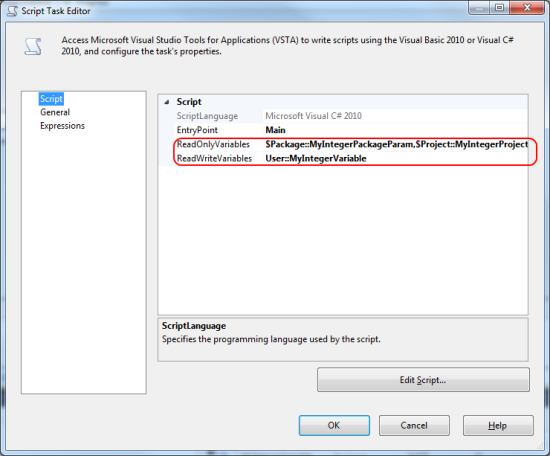 In SSIS 2012 there is a new task to set the value of variables: Expression Task. For previous versions of SSIS or for more complex constructions you need the Script Task. Here is an example on how to use variables and parameters in a Script Task. First you need to add the variables and/or parameters to the readonly and/or readwrite variables. Edit the Script Task and in the Script Pane you will find two textboxes: ReadOnlyVariables and ReadWriteVariables. They are for variables and parameters. A child package can read the variable values of a parent package with a Script Task. 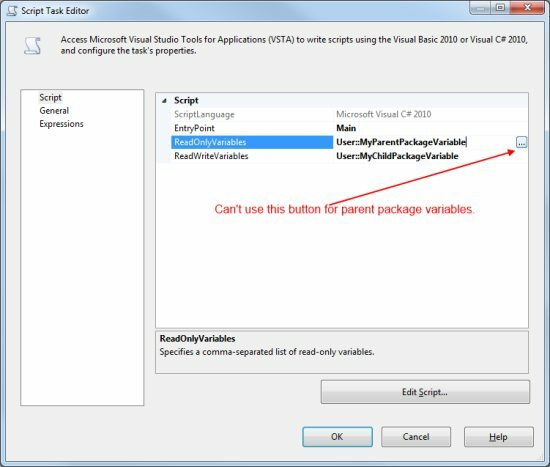 But because the names of those parent package variables are unknown for the child package at design time, you can't select those variables names with the select window. So you have to type the exact name (incl. scope) in the readonly variables textbox of the Script Task. Make sure you don't use the same variable names in the parent and child package, otherwise it won't work. For a VB.Net version of the code and more details check this blog post.